In the vein of Jurassic Park, this high conceptthriller follows a group of graduate students lured to Hawaii to work for amysterious biotech company—only to find themselves cast out into the rainforest, with nothing but their scientific expertise and wits to protect them. Aninstant classic, Micro pits nature against technology in vintageCrichton fashion. Completed by visionary science writer Richard Preston, thisboundary-pushing thriller melds scientific fact with pulse-pounding fiction tocreate yet another masterpiece of sophisticated, cutting-edge entertainment. Michael Crichton has sold over 200 million books, which have been translated into thirty-eight languages; thirteen of his books have been made into films. Also known as a filmmaker and the creator of ER, he remains the only writer to have had the number one book, movie, and TV show simultaneously. 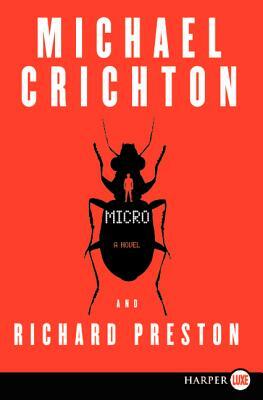 At the time of his death in 2008, Crichton was well into the writing of Micro; Richard Preston was selected to complete the novel. Richard Preston is the internationally bestselling author of eight books, including The Hot Zone and The Wild Trees. He is a regular contributor to The New Yorker. He lives with his wife and three children near Princeton, New Jersey.